“Ending hunger requires two fundamental ingredients. In the short term we must underwrite the direct distribution of food to those currently hungry and starving because of the disruptions of war, internal upheaval, drought, floods, pestilence or AIDS. Sudan, Rwanda and North Korea are current examples of nationwide emergency hunger needs. “In the longer term technical, advisory and financial assistance must be provided to strengthen agricultural production and food distribution and to improve the quality of rural life on the farms and in the villages where most of the people of the globe reside. We also need to strengthen and protect our forests, fisheries, land, water and air. George McGovern, Ending Hunger Now: A Challenge to Persons of Faith. Whenever, as now, man is in a quandary, unsure whether to go forward or back, to the left or the right, there emerges an interesting phenomenon: signs are looked for, even by those who do not believe in signs; unexplainable happenings are taken seriously and given meaning; men search for the key that will open the door through which they must go to the future, unsure, as yet, of what that future may hold for them. The signs that would guide them are there in abundance but men soon forget the wonders which have been lavished on them for many years. Thus, in the main, men miss the very indications for which they search and for which they beg. The time is soon coming when men will remember the signs and accept them as true portents of the days to come. They will understand them as a planned manifestation synchronized with the emergence of Maitreya and His group of Masters at this unique time in the history of the world. Many and varied have been these signals to men that something momentous and wonderful is afoot on Earth. For those with eyes to see, they have stood as a reminder to man that there are many areas of life that remain unknown and mysterious, that there are laws of which men know but little, and, above all, that man is not alone. Since there are signs, there are creators of the signs. All religious groups await and expect their chosen divine revelation and read the signs as confirmation of their faith. Such confirmation sustains them in perilous times and gives them hope for a better future. In this way a climate of expectancy and hope is created among many millions and prepares them for the events which now are imminent. Few can deny the signs although their meaning may be obscure. They quicken the intuition and the imagination of men and open their hearts to the revelations which are to come. From statues which weep and move to light patterns which adorn the fronts of buildings across the world; from shining crosses of light to milk-drinking Hindu gods, the signs are endless. Few can have been untouched by these wonders. Doubters and sceptics, of course, are ever to be found. But not for long. Very soon, the climate of expectancy will grow and register firmly in the minds and hearts of men everywhere, and into that expectant atmosphere Maitreya will enter and begin His open mission. Thus will it be. Q. President Ahmadinejad of Iran seems not to care whether he stirs up crises in the world. (1) Apart from being rather extreme is he unstable? (2) Or is it true that he does not fear a catastrophic war since he believes it will bring (in an Armageddon-like scenario) us all that much closer and more rapidly to Paradise? Q. The EU backs proposals for a new UN Human Rights Council to replace the UN Human Rights Commission. The new Council would be required to review on a periodic basis the human rights records of all countries, beginning with its members. The USA is against replacing the existing Human Rights Commission. US Ambassador to the UN, John Bolton, says it’s unacceptable. The Human Rights Conference, always held in March each year, has not yet been announced for 2006. (1) What would be best for the human rights? (2) Why is the US against a self-vetting council? A. (1) The new Council would have sharper teeth. (2) Guantanamo Bay and torture prisons abroad, for example, are areas that the US do not want to be too closely scrutinized. Q. Why will Maitreya appear in the United States instead of in other countries? A. He will appear in other countries. He will appear first in America in such a way that He can speak to millions of people. Then in Japan. Which country do you think has the largest and most influential media network in the world? If He appears on a major network in America He can be heard immediately by millions of people not only in the US but, through the internet, all over the world. Eventually, after the Day of Declaration when He is known and accepted by humanity, He will make a pilgrimage around the world. Q. Does Maitreya think we will change the world if we are selfish and competitive? A. Yes. Not everybody is selfish and competitive. Probably the majority of people are partly selfish and partly altruistic; people are mixed, not one hundred per cent this or that. There are degrees of selfishness and altruism. There is a great body of people who are ready for an unselfish action, ready to see justice in the world and therefore sharing. About five or six years ago, I asked my Master whether Maitreya had His one billion yet. Yes, I was told, Maitreya had 1.5 billion people He could call on. So it was 1.5 billion people out of 6.5 billion in the world – people whom He knew to be of goodwill; ready to change, altruistic and ready to see new structures and new ways of living. Now, there are 1.8 billion people He can call on – more than enough. Q. Please comment on the importance of publicly-owned land and facilities particularly in urban areas in the future. And particularly as related to Maitreya’s priorities and the art of living. A. All cities need publicly-owned land free from buildings or many buildings. One of Maitreya’s future priorities, which my Master has written about, is the beautification of our cities. That must include the creation of far more parkland than most cities have today, for leisure, for recreation, for simply sitting in the sun and watching the butterflies. Or land for the temples or objects of force that will be built in certain open spaces which will create equilibrium and residual energy for that area of the town or city. It is the study, therefore, of the energetic properties of forms like the tetrahedron or pyramid, which have energetic properties simply because of their shape. Shape power is another term for that. There are many shapes of power which, when aligned, will be used to change the climate and benefit the air quality of cities throughout the globe. Q. I would like to know if there is any relationship between the UFO phenomenon (extra-terrestrial beings) and the Masters of Wisdom you talk about? A. All the planets of our system are populated (although not at the same dense-physical level as on Earth). Each planet has its own Hierarchy of Masters all of Whom (including ours) are in contact with each other. The large majority of the UFOs we see come from Mars and Venus. Q. Do you have any information about the existence of the soul being proved by science? A. The Master Djwhal Khul, Who gave the Alice Bailey teachings, stated that the privilege of presenting to the world the scientific evidence proving the existence of the soul might come through a French scientist. It wasn’t entirely definite, but it will be proved. The Art of Living was the theme of Benjamin Creme’s keynote talk at the American and European Transmission Meditation Conferences in 2005. The talk was published in Share International January/February 2006 and Part One of the Question and Answer sessions from the Conferences was published in the March issue. The following is a small selection from Part Two. Q. How do we transform the conditioning of daily life into our personal attempt towards the art of living? A. By resolving the conflicts which prevent the creation of detachment. We are either attached or free. It is one or the other. Conditioning is slavery, lack of freedom. Freedom is the given state. Conditioning alters that state into one of slavery. We are attached in a state of conflict. Overcome the conflict and suddenly we are in harmony. Then we find there is another conflict. We go deeper. This does not happen in a day. There is nothing I can say to you in a meaningful way that you could do for the next five minutes and you would be free. Nothing that is lasting in the human condition is done like that. The deep conditioning of oneself is a long process, so you have to work on yourself to be de-conditioned. Life itself brings about conditioning. We are human beings and we would not be on planet Earth if that were not the case. If we were on, say, Venus or Mercury, and were 8th-degree initiates, then there would be no question of talking about conditioning. We condition one another, our children and so on. That is all part of life as we live it. De-conditioning releases you from conditioning and, therefore, attachments. It is a process; you cannot say: “I am going to be detached” from one moment to the next. It is not like that. The more you work on yourself, the more detachment grows. You sacrifice your need for the attachment. We need the attachment because we need our conditioning. It satisfies us from an astral/emotional point of view. That is why we have to overcome the attachments of the astral plane. First of the physical, then of the astral, then of the mental plane, until we are de-conditioned on all three levels. De-conditioned means less and less attached. These are all attachments formed from experiences. I do not think anybody in the world is polarized on the physical plane any more. The bulk of humanity is polarized on the astral plane. That means it is their seat of consciousness. The attachments formed by their focus on the astral plane through identifying with their emotions (which we take to be real but which are quite unreal, like dreams) condition us. The experiences of the astral plane are unreal. They are nothing more than thoughtforms. If we attach an emotion onto the thoughtform, we are attached to that. It triggers every time something reminds us of that experience. It triggers the same reaction, and so forms the attachment. Conditioning is another name for attachment. We do the same thing on the mental plane. It is much more difficult to see on the mental plane because the attachment for most people is emotional. That is called glamour or illusion, but until we see the illusion, become aware of it, we cannot de-condition ourselves. To be attached, to be conditioned, is the same. They are part of the unreality which we call life. But it is unreality which we have to go through because that is how we grow in conscious awareness. If, however, conscious awareness is limited to the astral plane, then we live in that glamour, that illusion, about the nature of life. The nature of life is very different in reality from that sensed by most people because it is sensed as all taking place on the astral plane. Every experience is wrapped up in astral matter, the thoughtforms which tie us to the astral plane. We create the astral plane out of our thoughtforms. Q. How do we transform the conditioning? – Honesty of mind, thinking in a straight line. He says most people think one thing, say something else and do something else again. What we think, what we say and what we do, are all different. There is no honesty of mind. – Sincerity of spirit. We copy one another and condition ourselves by copying. Conditioning is copying by not being yourself. If you are not yourself, then you have to be something else. You have to be something at any given time, and if it is not yourself it is something that is, in part, the not-self. So we are often the not-self. Occasionally, under certain circumstances, we become sincere in our hearts, in our minds, and act in that way, speak from the heart to the heart. But most people, in much of their actions, relate to other people to impress them, to create a vision in the mind of their companion which is favourable to themselves. That is the insincerity in which many people live. Am I not right? Think of oneself. Is that not the case? How many people are really, utterly and entirely themselves? A child with its parents, yes, because the child as yet is unconditioned. A young child with its parents is absolutely honest until it is corrupted. Then, of course, it acts up and says: “I know if I keep this up I will get what I want. You bet.” And so they will cry and cry and cry. Corruption sets in quite early, but at first the child is totally honest. It cries when it is hurt or hungry or tired and it smiles all the rest of the time. – Detachment: How many people are detached? Well, ask yourself how detached do you feel? How free from the need for other people are you? How free from the need for constant praise, the need for constant thanks, are you? So that everything you do, however little it is, they give thanks for, and how you need that thanks. That little bit of praise! It keeps you going. It builds your ego. How can you say you are detached if this is going on all the time? Look for that which shows you how undetached you are. If someone praises you, does it make any difference to you? Mostly, I think you will find that it does. If you are detached, it should not make any difference whether people are for you or against you, giving praise or unflattering criticism. It should make no difference if you are truly detached. And if you are truly detached, you are not conditioned. We all suffer from the conditioning that sets in when we were children. Babies are not conditioned, but within a few years conditioning sets in. Those of you who have children, think on it, because we make life difficult for our children by conditioning them in what we think is protecting them. It is not on the whole protecting them. It is getting them to do what we want them to do – that is, mainly not be a nuisance. Honesty of mind, sincerity of spirit, and detachment are the key ways to overcome conditioning. Q. How should one educate a child in the art of living and Laws of Life without conditioning them? A child should not even know or recognize that you were teaching it the Laws of Life. It is up to you to recognize when you condition a child and not try to teach him that Maitreya is in the world and that when he is 12 he can do Transmission Meditation “like mummy and daddy do”. Teach the child, without pressure, to be as harmless as possible, and the way to do that is to be as harmless as possible in relation to the child. The child does what you do. If you are harmless, the child will be harmless. If you are harmful, even though you think you are harmless, then the child will be the same. We pass it on all the time. Q. What is conditioning, and how can you distinguish it from education in the art of living? A. Conditioning is education, but it is wrong, distorted, education. Conditioning is acting, thinking, experiencing the known, that which is not new, that which is already known. And if all your experiences are already known and are actually a function of memory, then they have nothing to do with the art of living. The art of living is essentially new from moment to moment. The essence of the art of living is that every moment is new. It is a creative experience coming from the soul. The art of living will provide greatest freedom for the greatest number of people, the greatest opportunities for the greatest number of people, the greatest degree of justice for the greatest number of people. That is the art of living. When, in everything that we do – whether as ordinary individuals or in charge of great enterprises – we create conditions in which the greatest number of people find good, the Common Good is exalted, maintained and strengthened. That is what the art of living is about. Q. Would you please give us examples contrasting leisure versus time? A. Leisure is not doing nothing. Leisure is doing what you would like to do, what rests the body, the mind, the heart, or which allows you the time to do for yourself something over and above what you do for the community. Your time today is usually given to the country in which you live, the community as a whole, for five days in a week. On Saturday and Sunday most people, in a developed country, have free time for leisure. Personally I do not think that is enough. I do not think anyone should be expected to work with full concentration for more than three or three-and-a-half days a week, leaving them four or three-and-a-half days for what I would call leisure. Leisure might be the most strenuous part of the week. If one is a mountain climber, then it is definitely going to be the hardest thing that one does that week. If one is a long distance runner, again it is going to be tough for three-and-a-half days. If we are engaged in taking a car to pieces and putting it together again, that could be a very hard, concentrated job, but a sheer joy given a certain mentality, with a visual memory for where the parts go back! There are different kinds of leisure and uses of leisure. Time and leisure are not contrasts. One upholds the other. The goods of the world, to a major extent, are made by the poorest groups in the world, who have no other option but to gather the tea, to make the suits, tools, radios, shoes, etc. The result of that labour is leisure for the people who receive the money when these goods are sold. They live lives of relative luxury and leisure. They can do what they want to do anytime. They can meet with friends and go riding, or go for a trip in the car, or to a cinema. They can take an airplane and go off to Europe or Japan for a few days. Leisure allows you to do all those things you would like to do as if you were on vacation. It is like having a vacation every week. I think people need space in which to be themselves, find themselves, know and experience themselves. Time-serving, of course, is doing a job. You cannot contrast leisure and time except to say that those who have time have leisure. If you have the time, you have the leisure. If you do not have the time, you do not have the leisure because you are doing something else. You cannot be happy because you are doing too much that is nothing to do with you. That is a major illness in the world today. A lot of people are constantly ill. It is a purely emotional and psychological illness because they are spending too much of their time doing what is against their nature and interests. They become mechanical, a machine, and lose touch with their inner selves. Q. How can we cultivate the attitude of leisure in the midst of our busy lives? A. Leisure is not an attitude. Leisure is having the time to do what you want to do, which is bubbling up inside you and you want to do it. Everybody wants to go on vacation. That seems to be bubbling up in everybody all the time. Leisure to me is not going on vacation, not going abroad, not getting on planes, but just going upstairs to my studio, shutting the door, sitting down and looking at what I have been doing. That is leisure, time to be who you are. Today, when people are at work, mostly they are not who they are. It is a parallel existence. It is their second life or second personality, which they have constructed in order to earn a living and live in this society, corrupt as it is. We have to live in it. We have to be here. Opting out of it will not do us any good. We are in incarnation at this time because of what is happening at this time. We have the task of making a new and better world. Creativity exists in every single son of God. It is a God-given quality. Creative activity is the nature of life lived under the Laws of Life. The art of living is creative living, which entails all aspects of life. You can be a mechanic, or a nurse, you can be …. Q. How will sharing the world’s resources help us to have more leisure time in the developed and developing world? A. It will help those in the developing world to have more time because they have to spend so much time creating the little that they have out of nothing. We in the developed world have all the time in the world to create the much that we have out of much. If the world’s resources were properly shared according to the needs of the different nations, it would involve only a redistribution of resources. It is all to do with distribution and redistribution. That is the basis of the economic problem today. Plans for a radical redistribution are already extant. They could be offered to humanity as soon as we accept the principle of sharing. By their very nature, this would give everybody much more leisure time than they have at the moment. So much of people’s time is used up in a purely mechanistic way to fill office blocks, fill up sheets of paper, file them away, take them out, read the files, write stories about them, hand them up to somebody who hands them up to someone else. Somebody signs something. It goes up and down the floors again, simply distributing pieces of paper that report on the various amounts of the different commodities which have been produced or will be produced, and the costs and profits which this will entail. All of that is done over and over again in millions of such office blocks throughout the modern world. It is a complete waste of human talent, energy and imagination. It makes terrible inroads into the possible leisure that people could have. These are not real jobs. They are completely constructed jobs to do with globalization and making sure that T-shirts made in Japan, China, Hong Kong or Costa Rica, and sold in the American market, are of such and such a design and quality. It is still to do with the distribution of resources. Most of our trade is recorded in this way. The most numerous relics we have of the Egyptian civilization are the reports on their trade. The cuneiform records, these massive amounts of tablets, are to do with: “Sold today three fish, one waste paper basket, two melons to so and so, received eight pesetas”, or whatever the coin was. They are solid, baked clay and took up a huge amount of space. What good does it do us to know this? It gives us a little view of the daily running of an Egyptian state thousands of years ago. If someone really insane wants to see how the people of the 20th and 21st centuries lived, they only have to look in the files of any of these huge skyscrapers, go through them for hundreds of years; devote their time and energy to reading the printing on these files, and then reading the emails to do with these files. They will get a very clear picture of the life of the nonentities who wrote them. What purpose would that serve? An enormous amount of time and energy of fellow human beings is wasted today by those who run the mechanics of the world, the production and sale of the multifarious and useless objects which are duplicated until there is no end to them. All to give us multiple choice. How many different ice-creams do we need? Is 50 enough? There are shops that sell more than the proverbial 50. The same goes for every kind of commodity that we produce today in every developed country. Almost nothing that America, Britain, France, Japan or anywhere else produce is needed by any other country. The objects are all produced to give ‘choice’ or the latest gadget to fit to the other gadgets which we already have and produce. It is a useless waste of human potential. When we share the resources of the world, we will get rid of a great deal of that. We need only keep records of the goods that have been exchanged by using the sophisticated form of barter which sharing will bring about. It will be totally simplified; our life will be simplified out of all recognition. We are not going to have even 50 different kinds of ice-cream. I know it is hard! My 13-year-old son spends a lot of his free time playing on the computer with an online game called RuneScape. It is a role game and takes place in the Middle Ages. Each player creates his own character, obtaining more or less the clothes and appearance for it. As you advance in the game you are able to add strength and better clothes to your character if you are skilful enough. As it is an online game, he plays with children all over the world. In July 2005, he called me as he was very perplexed. As he was playing inside one of the settings of the game, suddenly appeared on the screen a magician totally dressed in white. From his appearance, my son deduced that it was a very powerful character, who also wore a big white hat that normally is not so easy to obtain. As he had never seen him anywhere in the game before that moment, he felt curious to know who he was, so he placed the pointer of the mouse above the magician to identify him. To his surprise in the identification tag that appeared was the name ‘Maitreya’. As soon as the tag appeared, the magician opened his arms wide and transported himself out of the screen. In subsequent days my son tried to find the white magician again, but to no avail. Was something special behind the white magician called ‘Maitreya’? I had two experiences in my life that powerfully affected me. (1) The first was back in 1984 or 1985. I lived in an apartment building in Richmond, Virginia, USA. I had an accident where I slipped and fell over the banister of the building’s exterior staircase. I fell almost four floors (approximately 40 feet) and landed on the hood of a car. As I fell, I heard a male voice in my head that said “just relax, you’ll bounce”, and I seemed to slow down as I approached the ground. There was a man who appeared to be homeless who witnessed the event and asked if I was ok. I was wondering if you could tell me anything about what happened to me. I walked away with little more than a bruise on my chest (where I impacted the car). I can’t explain the voice or the feeling of being slowed down before impact. Was this an ‘intervention’? Were the voice and the homeless man a Master? (2) The second incident took place in Long Island, New York, USA, the last week or so of December 2000. I had been hospitalized for meningitis and suffered a great deal from this ordeal. After two weeks, I checked myself out of the hospital though I was still ill; I had no one caring for me and felt very, very lonely and anxious knowing that I would have to manage to nurse myself back to health. I walked out of the hospital, and was very aware of (and grateful for) the fresh air and sun on my face, when a ragged looking man with smiling, bright eyes said something simple that I can’t recall (like ‘hello’ or ‘have a nice day’). But I felt something from him that made me feel embraced in that quick exchange. After he passed, I turned to look back at him (a little puzzled, I might add), but he was gone. I felt as if that was some kind of a gift at the time. About a year later, I learned about the World Teacher, and was wondering if that man was either Maitreya or the Master Jesus. M.T., Valley Stream, NY, USA. In mid-June 2005, my daughter and I were traveling from San Diego to Los Angeles on a very busy Friday afternoon on the #5 Freeway in Norwack CA. We were involved in a car accident that is hard to describe. In fact, the insurance adjustor told me it was very unusual in her experience. I was in the second lane from the center in the four northbound lanes when I became aware of a motorcyclist lying on the roadway in the lane to my left, closest to the center of the road. I was able to stop and did so with the idea of protecting him and his motorcycle from being run over. The next moment, a very large sedan came up behind him and, seeming unable to avoid hitting him, drove toward my car. It seemed as if his car would go right into the front of my car and seriously damage it and injure me and my daughter. As if by slow motion, the car made a seemingly impossible turn, avoiding all but the very front of my car and drove across two lanes of bumper to bumper traffic, coming to a stop on the far side of the freeway, avoiding all the other cars on the road. As the emergency services arrived to deal with the accident, all were amazed. There was an almost out-of-time feeling and all involved were extremely calm and concerned about others. I feel so certain that divine intervention was involved. Even the repairs to my car were relatively minor. Am I correct? M.P., Half Moon Bay, CA, USA. In mid-January 2006 I lost my reading glasses and was really annoyed because they were new and not the cheapest spectacles. I turned the whole house upside looking for them and even looked in the garden. I was childish enough to keep looking in my glasses-case even though I knew it was empty. A couple of weeks later I woke one morning with an absolutely compelling idea: go and look in the glasses-case again. The case was in my handbag; I opened it up and voila – there they were! May I please ask who helped me? In the evening after Transmission Meditation on 1 October 1998, my friend and I went towards the car. The street was dark. As we were about to cross it a car stopped in front of us. The driver, a young and very good-looking man, asked my friend the way to the main square in town. When I heard his voice I was deeply impressed. It reflected love, justice and sincere kindness. It touched my heart. My friend explained the way, he thanked her and slowly drove off. When we were driving home along the main square we didn’t see his car. The next morning on the way to my office I felt joy and willingness to help people, to warm up my relationships and to make contact with those who seemed to be far from my heart recently. Whenever I recalled the meeting with the stranger during the next few days I felt warmth and love again. It seemed as if it flowed to the people I thought of. Did we meet a Master of Wisdom? On 8 February 2005 I was outside the hospital where I work at 6am and it was still dark. On two of the windows there was visible a beautiful gold-coloured light in the shape of a diamond, the corners of which were joined together by rays of a darker gold, more intense colour so that they formed an equal-armed cross in the middle (see photo). There were no other large windows opposite to reflect the light back onto these. If I stood directly in front of the doors the cross was right in front of me and if I moved to one side it looked as if the cross moved too so that it was always directly in front of me. It looked just like a hologram. The longer I looked the more impressive it became: it felt as if all burdens were being lifted, as if absolute peace and a divine love were streaming into my heart and embracing my whole being. Other colleagues also saw the Crosses and were also moved in the same way. 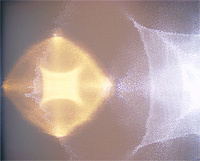 Were these crosses of light manifested by Maitreya? In what seems to be a new addition to the scores of miraculous signs, photographs are appearing in the USA and Mexico in which a figure in white can be seen emerging from a bright column of light. In April 2005 the congregation of the Fountain of Living Waters Church in San Juan, Texas, USA, were overjoyed when a member showed them her photograph of ‘Jesus’. The church member, from McAllen, Texas, who wishes to remain anonymous, took the photograph of a beam of light, but, upon developing it, found it showed the figure of ‘Jesus’. According to Reverend Daniel Villareal the photo has been associated with several healings and prayers being answered. The first reported instance of the phenomenon occurred around Easter 2001 near Mexico City. Seeing an intense beam of light, a passenger on a bus from Puebla to Veracruz asked the bus driver to stop in order to take a photograph. Only when the film was developed did the photographs show a man emerging from the beam of light. In the Philippines region of Leyte people have reported seeing an “old woman in white” who went around warning villagers of the impending danger of the mudslide that buried the entire barangay [village] Guinsaugon on 17 February 2006. The old woman in white was reportedly seen in two villages around the municipality of Saint Bernard in southern Philippines. In Tambis II the woman visited the house of Rosita Arado on 15 February 2006. A number of residents saw the old lady who was also said to be wearing a big cross. When the news reached village captain Vicente Merto of Tambis I, he organized a procession and prayer vigil to St Jose. Large orbs of light have been found on photographs taken in a Texas church. It all began when Velma Alexander, a church prayer intercessor, discovered oil manifesting on the balcony, baptismal and pulpit of the sanctuary of the Riverwalk Fellowship Church, a charismatic church in Haltom City, North Texas, USA. “Somebody better call Pastor Steve ’cause oil don’t come outta wood and brass!” she exclaimed. Pastor Steve Solomon, a Messianic Jew (who recognizes Jesus as the Messiah), had photographs taken of the oil which then revealed the orbs of light. There is also a video taken by a teenage boy which shows an orb of light (visible in spite of being taken in the dark because of a powercut) moving through the body of a church member, which “starts at her feet and goes right through her body out of her head”, says Pastor Solomon. When CBS went to investigate, their picture of a woman who was being prayed over revealed a “very large blue orb hovering over [her] head”. Loyd Auerbach of the Office of Paranormal Investigations in Berkeley, California, believed that, once obvious causes such as light, dust and tampering were eliminated, it could be psychokinetic energy from the person or between the people which had affected the film during healing. Other studies on orbs during the past 20 years have proved that thoughts or energy can affect film, he said. ‘Miracle in Toeging’ was the headline in the Munich newspaper Abendzeitung about the following incident. In February 2006 in a supermarket in the German town of Toeging (about 80 km from Munich), a young trainee heard a strange noise, ran out of the building, saw the danger, ran back and shouted: “Leave the place at once”. He took people by the hand and as soon as they had all left the supermarket – within seconds – the roof crashed to the ground, burying 800 square metres of the building. Nobody was hurt – the 12 people who had been in the supermarket were saved. “God sent his angels,” the priest of the nearby church said. Was there any ‘spiritual help’ involved? During an Oprah Winfrey television show a woman recounted an experience which happened in the USA in October 2004. The woman described how a teenage friend of her daughter, Laura Hatch, had vanished in her car. The woman did not know the girl but was shown a photograph of her and to comfort her daughter she said they should pray for the girl’s family. That night the woman had the same dream, three times. In the dream she saw a traffic junction – one she had not been near for more than six months. After dreaming the same scene three times, she had yet another dream in which she registered the words: “Keep on going, keep on going”, but spoken by the White Rabbit from Alice in Wonderland! This fourth dream she kept to herself for fear of ridicule. She did however act on her strong impression the next morning that perhaps the missing girl could be connected with the intersecting roads of her dream. She and her daughter drove out to the spot. On the way there she felt a “warm feeling” come over her body, it felt “right” and gave her confidence in her dream. Once there they got out and walked around – nothing. Feeling foolish they returned to the car. On an impulse she decided to turn in the opposite direction. This immediately felt right again, and at some point she had the distinct impression that the steering wheel was being pulled gently to the left. She pulled over, stopped, got out, looked around. At first, nothing. No signs of anything. Then suddenly they spotted something through the trees down a steep slope; perhaps it was a piece of a car wreck? It turned out to be a bag of rubbish. Since she had not mentioned the “White Rabbit’s” words to anyone the woman took this as again a sign, and continued downhill. They suddenly noticed damage to the trees, as if a swathe had been cut into the forest. There they found the car, and inside it the missing teenager – injured, very weak but still alive after eight days. Needless to say, all are now well, happy, puzzled and amazed. 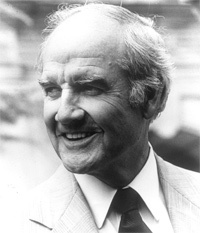 George McGovern is a former US Senator from South Dakota and was the 1972 Democratic Party nominee for President (see photo). In 1960, President Kennedy named him the first director of the Food for Peace Program. President Clinton appointed him US Ambassador to the United Nations Agencies for Food and Agriculture in 1997. In 2001 McGovern was appointed UN Global Ambassador on World Hunger. He is the author of several books, including The Third Freedom: Ending Hunger in Our Time, and co-author of Ending Hunger Now: A Challenge to Persons of Faith. Monte Leach interviewed him for Share International. Share International: You have been involved in the hunger issue for many years. Why does hunger persist in the world when there is enough food grown to feed everyone? George McGovern: It is a political problem, a lack of political will. We lack the energy and persistence to ensure that poor people who cannot produce enough to feed themselves get the food that they need. About one out of seven people in the world are chronically hungry. But it is not an insoluble problem. The governments of the world, both in the poor and the wealthy countries, have to make a commitment that they are going to close that gap. They can do that for a fraction of what we are spending on the war in Iraq, for example.The UN has a couple of good agencies working on the hunger problem. One is the World Food Program, which I helped launch in 1962. They are the best food distribution agency in the history of the world. They move enormous quantities of food to hungry people, but they have to do more. The US is their principal supplier. If we could increase our contribution to perhaps double what it is now, and other countries would follow suit, and governments in the poorer countries would co-operate with us, we could put an end to hunger in the next 15-20 years without any strain.That is what I am working on now. Bob Dole [former US Senator] and I have decided to make an all-out effort to get the UN, with the US in the lead, to provide a nutritious school lunch every day to the 300 million school kids around the world who are now receiving nothing. That is our principal focus right now. SI: Can you say more about this international school lunch program? Who would administer it? GM: It would be administered by the UN World Food Program. They would tap into the help of private voluntary agencies like the International Red Cross, Salvation Army, Catholic Relief Services and American Friends Service Committee. There are about 35 voluntary agencies that can help administer the program, but it would be run under the general supervision of the UN World Food Program. SI: Is the program in effect now, or is it still being developed? GM: We have had large pilot programs in 38 countries. We persuaded the Clinton administration to give us $300 million to get it started and the funds became available in 2003. We received another $200 million from the Bush administration. We are trying to get other countries to join with us, and so far a half-dozen have. We are going to continue until we reach 300 million of these kids. SI: You’ve spoken publicly about one positive by-product of the school lunch program, which is helping to alleviate the overpopulation problem. GM: The best magnet anyone has found anywhere in the world to pull poorer kids into school is the promise of a good meal. When you pull kids into school, and the girls get at least six years of education, you can cut the birthrate in half – from an average of 6 children to 2.9. This information comes from United Nations studies. This lowering of the birthrate comes about solely from the strength of elementary education, without abortions or other surgical procedures. Girls who have a little elementary education do not get pregnant as often. They marry four or five years later in life and have a better sense of what life is all about. They are better able to care for the children they do have. SI: Is the school lunch program the same as the World Food Program’s 19 Cents a Day Campaign? GM: Yes. Nineteen cents is what it costs for a single daily school lunch for one child. SI: Isn’t it amazing that it costs only 19 cents a day to feed someone? If more people only knew that they could really make a difference with only 19 cents a day. GM: And it’s good nutritious food. With 300 million kids to feed, 19 cents a day is a lot of money. But it’s well worth it. It’s only a tiny fraction of what the Iraq war costs. We would make a lot more headway on terrorism if the US led the way in wiping out hunger, AIDS and diseases of all kinds. That’s where America ought to be using its resources. There would be fewer people who hate us enough to sacrifice their lives blowing us up if they saw us giving more to help the world’s hungry and poor. 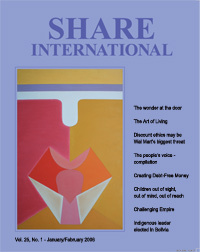 SI: Speaking of what a developed nation like the US can do to help, our magazine is called Share International. Our philosophy is that we have to share the resources of the world more equally among the rich and poor because the wealthier nations use and waste a vast majority of the world’s resources. GM: We have to share more. If we are going to have a world society that hangs together, we’ve got to work together. Although it is one of the most urgent problems, hunger is a long way from being the most difficult to solve. SI: Do you think there are proven solutions if we could only implement them? Or do we still have to figure out what to do? GM: We know how to solve the hunger problem. People say it’s a distribution problem. We know how to distribute food. We know how to package it. We know how to process it. We know how to run a school lunch program efficiently. We just have to develop the will to use our God-given brains and hearts and consciences to deal with the problem. I think it can all be done in the next 15-20 years. SI: What do you see happening now that gives you this sense of hope? Do you see evidence that this can be achieved? GM: Yes, I see it in the 38 countries where we have pilot programs for the school lunch program. People are just ecstatic about it. They are going to force their politicians to extend it to everybody. Then Country A sees country B doing this and they are under pressure to match it. But these kinds of things take time. It’s not a matter of weeks or months. It’s a matter of years. I’ve learned to be patient about things. You can’t be discouraged. You have to keep working at it. SI: How do we generate the political will to end hunger? How do we get there from here? GM: People like me keep hammering away. We are trying to get the churches behind it. That is why I co-authored this recent book, Ending Hunger Now – A Challenge to Persons of Faith. We’re getting that book distributed through churches, synagogues and mosques. In due course, I think we can arouse enough support to complete the task. SI: There are also nonprofit groups like ‘Bread for the World’ and ‘Results’ that lobby politicians on behalf of the poor and hungry. They are helping to develop the political will in the United States to end hunger. GM: They are wonderful, first-rate groups. There is another group called ‘Friends of the World Food Program’ in Washington DC. They do a great job. They are pushing very hard for this international school lunch program. They have a budget of quite a few million dollars that they invest in trying to educate the US Congress and public on the need for more effort and assistance. SI: What do you tell people who ask what they can do to help? GM: I tell them to support their churches, synagogues and philanthropic organizations. Every church has a world service arm. People should find out what that organization is in their church or synagogue and support it. Tell them that you want that money spent to reduce hunger. And if you want to, send your money directly to the UN World Food Program. Further information: George McGovern, The Third Freedom: Ending Hunger in Our Time. Simon & Schuster, New York, USA, 2001. George McGovern, Bob Dole, Donald E Messer, Ending Hunger Now: A Challenge to Persons of Faith. Augsburg Fortress, Publishers, Minneapolis, USA, 2005. There is a growing realization in the world that war, conflict and the harbouring of ancient or recent resentments serve only to tie us into a cycle of never-ending violence and tension. Increasingly old enemies are turning to reconciliation and forgiveness, compromise and co-operation. Benjamin Creme’s Master has written: “Unity and co-operation are the springboards to the future and the guarantee of achievement for all men. Great reservoirs of power lie untapped within humanity waiting for the magic of co-operation to unleash.” Here we present a small selection on the theme of co-operation which includes quotations from Maitreya (Messages from Maitreya the Christ), Benjamin Creme’s Master (A Master Speaks), and Benjamin Creme’s writings. The soul does not know what competition is. It knows only goodwill, and it is through goodwill that co-operation comes. As soon as we accept the principle of sharing, and create justice in the world thereby, we will come to the end of competition. The scourge of competition is based on two things: greed and fear. Greed is the outcome of fear. Fear is the basic, fundamental expression of that which is against life. When you take away fear you release the energy of life. This is why the capitalist system is based on freeing people to explore their creativity. However, it is seen in purely individual and materialistic terms; it leaves out the soul aspect which expresses itself collectively. The individuality of which everyone is so proud has to be put at the service of the group. When this is done, individuality changes its nature. Instead of being competitive, it becomes co-operative. It expresses divine goodwill. Now, as we enter the time of renewal, men should understand the principles on which a correct advance can be made … Co-operation is the key to the new relationships. When co-operation reigns, the iniquities and inequalities of the past will cease. The fires of competition, fanned by selfishness and greed, will die down, enabling men to live in harmony and trust. So will it be. And so will the Plan, which is the Purpose of God embodied, be fulfilled. Many are the steps which must be taken towards that blessed state, but already men’s minds are turning hopefully in that direction. Each day, man looks anew at his life and fails to discern the causes for his discontent … Thus stands man at the crossroads of his life, awaiting a new dawn or a fateful and final slide into catastrophic war. Into this scene emerge Maitreya and His group of Masters carrying with Them the Banner of Peace and Love. Round Them are gathered Their disciples, ready to do battle in the cause of Justice and Peace. Their war cry is Unity – Justice and Freedom for all. They know the rules of combat – conquer by Love and Service. They know the needs of the time and are ready for every sacrifice. They know Their tasks and wait, impatient for action. Listen for the sound of Their music – Beauty and Truth. Watch for signs of Their hand – Co-operation, Sharing and Joy. Make ready to recognize and work with these Warriors of the New Time and fulfil the purpose of your incarnation. Bono, rock-star, activist and co-founder of the humanitarian organization DATA (Debt AIDS Trade and Africa) was the invited keynote speaker for the 54th National Prayer Breakfast in Washington, DC, on 2 February 2006. His speech to those gathered – the US President, King Abdullah, other heads of state, members of congress and many other dignitaries – was humorous and passionate. He urged American leaders to follow through with promises to aid the world’s sick and impoverished; he praised, cajoled and challenged his listeners with his powerful and simple message. “It’s not about charity, it’s about justice…. But justice is a higher standard. Africa makes a fool of our idea of justice; it makes a farce of our idea of equality. It mocks our pieties, it doubts our concern, it questions our commitment. “6,500 Africans are still dying every day of a preventable, treatable disease, for lack of drugs we can buy at any drugstore. This is not about charity, this is about Justice and Equality. The voice of the people continues to grow, with large demonstrations taking place across and the world. In Thailand, tens of thousands of protesters congregated in Bangkok for regular weekend rallies to call for the resignation of the Prime Minister Thaksin Shinwatra, whom they accuse of corruption and abuse of power. On 5 March 2006 an estimated 67,000 demonstrators marched to the Prime Minister’s office and vowed to stay in the streets until he quits. In the Philippines thousands of protesters gathered to celebrate the twentieth anniversary of the ‘People Power’ movement in 1986 – which led to the toppling of dictator Ferdinand Marcos – and to call for the resignation of the current President Gloria Macapagal Arroyo. In response Arroyo called a week-long state of emergency, citing an attempted coup, and protests were dispersed with water canon. However, around 5,000 people, led by former President Corazon Aquino, were allowed to march peacefully to a memorial of Benigno – Aquino’s late husband and a popular political opponent of Marcos – whose assassination in 1983 sparked huge protests. The demonstrators accuse Arroyo of corruption and human rights abuses as well as alleged election-rigging in 2004. They criticized her clampdown as suppressing dissent. There were further demonstrations against the government, again met by police aggression, on 8 March, on International Women’s Day. In Haiti, there was another example of people power, following presidential elections where René Préval, a former President and the choice of the poorest sections of Haiti, was finally declared winner. Although well ahead of his nearest rival Gérard Latortue, Préval polled just below the required 50 per cent needed to gain victory. But his supporters claim Préval, who campaigned on a platform of unity and stability, was being deprived of the presidency by vote fraud. Huge numbers of Préval’s supporters took to the streets to demand his victory, urged by Préval to “be mature, to be responsible, to be non-violent”. In Kazakhstan around 2,000 protesters defied a ban on demonstrations on 26 February 2006 to condemn an alleged government role in the assassination of opposition leader Altynbek Sarsenbaiuly, who was found shot dead in his car on 13 Febrarury 2006. In India President Bush’s arrival on 1 March 2006 was met with huge demonstrations against his visit. Around 100,000 protesters gathered in the capital Delhi holding placards telling Bush to “go home”. Similar protests were held in Calcutta, Bangalore and Hyderabad. Speakers at the rallies said Bush was not welcome and denounced the Iraq war. 2005’s Make Poverty History campaign helped mobilize a generation of young people to be politically active, according to a survey for UK charity Oxfam. Eighty-four per cent of British 16-25 year olds said that the campaign to end world poverty and the Live8 concerts had had a big impact on them, much more than London’s Olympic Bid (54 per cent) and the general election (35 per cent). Two-thirds of respondents said they had worn the campaign’s white bands and 64 per cent said that Make Poverty History had inspired them to do more to end global poverty. Nearly half said they would attend rallies or events this year and 45 per cent said they would donate money or goods to charity. The survey of 1,400 16-25 year olds carried out for Oxfam’s website Generation Why, which is aimed at young people and which received five times more visitors in January 2006 than the previous year, also showed that respondents were not put off by celebrity endorsements of the campaign, with 78 per cent saying they got “the message to people who might not otherwise care”. Only 6 per cent thought that celebrity involvement trivialized the issues. “We have opened the Pandora’s Box, and the question is, what is the way forward?” said Zalmay Khalilzad, US ambassador to Baghdad, in an interview with the Los Angeles Times in March 2006. Breaking with his own government’s optimistic pronouncements, he warned that without a substantial US presence sectarian conflicts in Iraq could lead to rising religious extremism and a regional war. This, he said, would draw in other Arab countries on the side of the Sunnis and Iran on the side of the Shias and “would make Taliban Afghanistan look like child’s play”. The solution was to build bridges between religious and ethnic communities, he said. The US government, however, is looking at how to reduce the number of US troops in Iraq.